Well it is not really Iron Man, and it looks nothing like the hero that is, but it is based on the same premise. Similar to the HULC, this the XOS2 is currently being produced and tested by US Defence backed technology firm Raytheon Sarcos. The Exos as it is pronounced, is designed to enhance the human body and it’s abilities. 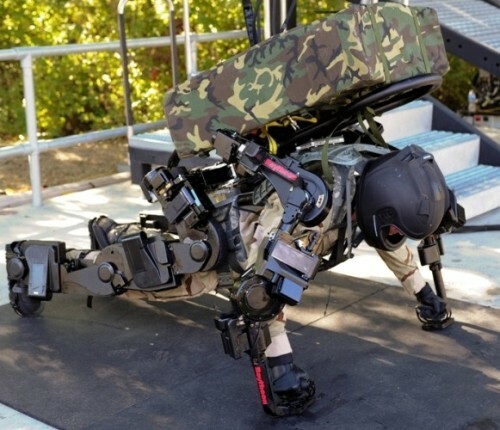 The suit allows the user to carry in excess of 70KG with very little effort as well as punch your way through 4 planks of wood in a single strike (ever heard of Bruce Lee?). 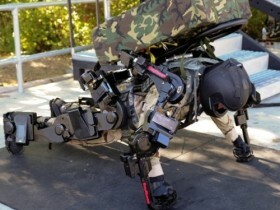 It is planned to be made available in two options, one legs only aimed at combat in the field and supporting heavy backpacks, and the other a full body suit for carrying supplies. Although they hope to test this in the field within 3 – 5 years, it would be expected to used a tethered power-source…. Yes really, can you imagine just going to grab a terrorist and not being able to quite reach? ‘I need another extension lead boss’ as you are taunted by Osma just a yard away, imagine a dog on rope, not quite being able to bite you.